There are all kinds of tomato sauces out there. There are store bought like Hunts, Bertolli, and Ragu. 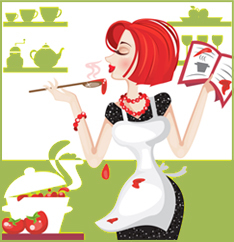 And a quick search will lead you down a myriad of homemade recipes, full of basil and garlic, tomatoes and simmering. You will find that there are lots of recipes out there that use a pretty decent amount of ingredients, using a complexity of flavor to deliver the final taste. There is a recipe for tomato sauce out there however that is simple in both it’s ingredients and it’s preparation. There aren’t a lot of frills here, it’s so basic that I swear it was invented by a kitchen full of toddlers. The taste though. That indescribable taste of a freshly made tomato sauce that will make you never want to walk down a store aisle full of commercial sauces again. 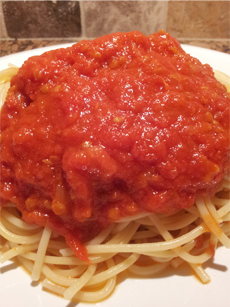 In regards to the tomatoes used in this sauce, try to use the freshest tomatoes possible. If you have a garden, well you’re set. Some use canned tomatoes (try to get a good quality here), however if you don’t mind some extra work I recommend buying a large quantity of plump, ripe, tomatoes. And it is going to take quite a few tomatoes to make your own tomato sauce, depending on how much sauce you plan on making. Feel free to adjust the amount accordingly, the recipe below will make a 3-4 dishes worth of sauce. Did I mention how simple the ingredients list was? That really is it, and I’m sure you’re viewing that list with as much apprehension as I did the first time I saw it. There is no way something that simple can be that good. We all know however that sometimes the best things in life are the simplest. Cut the tomatoes into large chunks, you don’t need to dice. Place in a saucepan along with the butter and onion halves. Salt to taste. Bring to a slow but steady simmer, and simmer for approximately 1 hour and 15 minutes, stirring occasionally. Break up any large chunks of tomatoes as they break down. If after an hour it still seems runny, you can turn the heat up a bit to evaporate some of the extra moisture. Just don’t do too much because you don’t want to scorch the sauce. By the end you should have a nice, somewhat thick sauce. 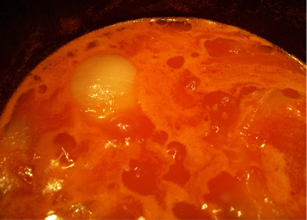 You can simmer for longer as well to make a thicker sauce although it loses some of the tomato flavor. Remove the onion before serving. Place over some pasta and revel in one of life’s treasures. And if in the end it’s not complex enough for you, there now lies a great tomato sauce base to start from!